This time has been set aside for Publishers to arrange meetings with their respective editors and other interested persons. The INANE 2014 Planning Committee is not arranging these meetings, however, to facilitate travel planning for attendees, we will share details of scheduled meetings here. Elsevier, 9:30 am to 1:30 pm. Armory Room. Lunch will be served. Lippincott, Williams, and Wilkins, 9:30 am to 1 pm. Portland Room. A light breakfast and a box lunch will be served. Wiley, 10 am to 1 pm. Regency Room. 1:30 pm to 5:30 pm: Discover Portland! Discover Maine! INANE 2014 will open with 90 minute narrated trolley tours for all attendees. The tour will provide a history of Portland and include a visit to Portland Head Light in Cape Elizabeth. The lighthouse was commissioned by President George Washington in 1790 and is one of the most photographed sites in the US. 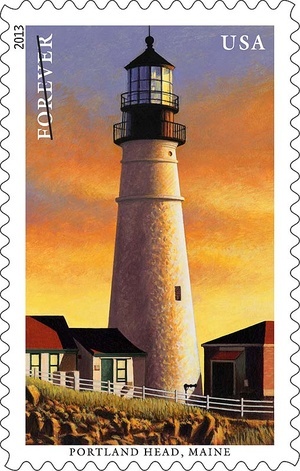 It has recently been commemorated on a stamp! Each trolley accommodates 32 people and 6 trolley trips have been reserved for the afternoon, to ensure that all INANE attendees will have a seat. Trolleys will be departing on their tours at intervals throughout the afternoon (1:30; 1:45; 2:15; 3:30; 3:45; 4:00 pm). Seats are not reserved—board the trolley at the front of the hotel. We encourage getting on an early trolley if possible to accommodate everyone throughout the afternoon. 3:30 pm to 5 pm: Meeting of the Planning Committee for INANE 2015. Longfellow Room. Our introduction to Maine will continue with a presentation on Maine Through Artists’ Eyes by Jessica Nicoll, Director and Louise Ines Doyle ’34 Chief Curator at the Smith College Museum of Art, Northampton, Massachusetts. 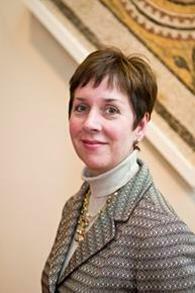 Prior to assuming her position at Smith in 2005, Ms. Nicoll was the William and Helen Thon Chief Curator and Curator of American Art at the Portland Museum of Art for thirteen years. Beginning at 5 pm and continuing until 8 pm, we will have a gala reception in true INANE tradition. A formal welcome to attendees by a representative of the City of Portland, followed by Ms. Nicoll’s presentation, will begin at 6 pm. Join your colleagues in Maine for an exciting event! Donations to Suzanne Smith Development Fund are gratefully accepted at any time. Monies raised are used to support the Suzanne Smith Mentoring Editors Awards for 2015 and beyond. Holly Smith, "in memory of my sister Suzanne"
Mark Coletta, "Suzanne's loving son"
Kim Coletta, "Suzanne, greatest mom ever!" Brett Diamond, "in memory of Suzanne and in honor of Mark and Kim"
Eleanor Hobbs, "my walking partner, Suzanne"
Alison Stuart, "my loving aunt Suzanne"
Susan Gannon, "Suzanne & her ever-present smile"
Joy Detra, "a golfing friend"